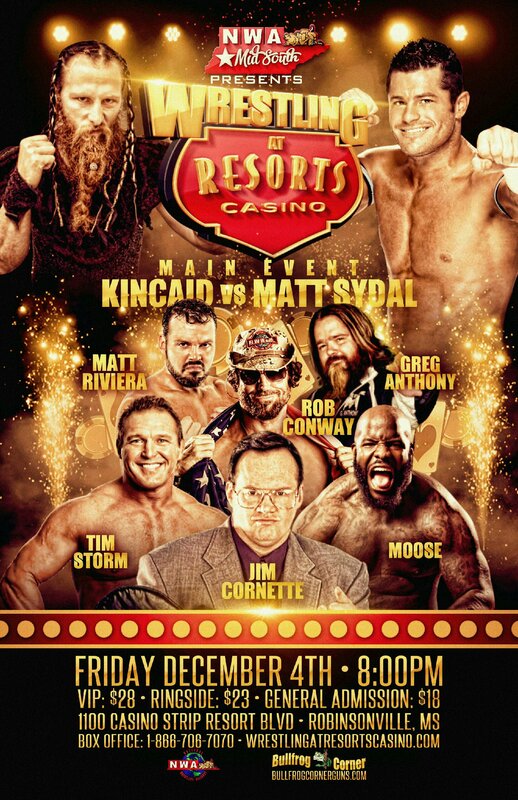 NWA Mid South presents Wrestling at Resorts Casino, December 4th! Home / NWA MIDSOUTH / NWA Mid South presents Wrestling at Resorts Casino, December 4th! In a little over a year of existence, NWA Mid South Wrestling has brought in the biggest names from different NWA Promotions & Professional Wrestling itself to appear at our events. On December 4th, it will be no different when we present Wrestling at Resorts Casino in Tunica, Mississippi! The NWA Mid South Wrestling Championship Committee has worked closely with NWA Mid South Branch Manager Jon Michael to put together what will undoubtedly be a supercard of great wrestling on that evening. We’ve got several championship matches already signed as well as a Main Event so intense that it will blow you away! Check out the line up of matches below! Also signed to appear at this event are legendary manager of the Midnight Express Jim Cornette & “Manager for the Ages” Boyd Bradford. And making a Special Guest Appearance will be none other than the NWA Worlds Heavyweight Champion himself, “Godzilla” Jax Dane! It doesn’t get any better than that in the Midsouth area, folks! We will be announcing more matches as time goes on! For more information, you can stay tuned to our Facebook page(www.facebook.com/nwamidsouth) and follow us on Twitter at this address – @NWA_MidSouth. You can also stay tuned to the Facebook page for this event at this address -www.facebook.com/WrestlingatResortsCasino. Follow the event on Twitter at this address – @nwaresorts. You can also visit the website, www.wrestlingatresortscasino.com, for more information, including how to purchase advance tickets & book your hotel accommodations.